Congratulations to the 'Fan Favorite' winner in the International Supercomputing Conference Student Cluster Competition. Best of 12, Thunderstruck wowed the conference. 12 teams competed in the International Supercomputing Conference student cluster competition. 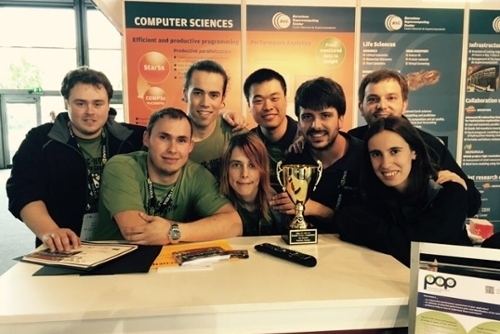 Spanish student team takes home Fan Favorite award at ISC16. Competition designed to introduce students to HPC technology and community. If you’ve been following the events at the International Supercomputing Conference 2016 (ISC16) in Frankfurt, you’ve probably been Thunderstruck. Thunderstruck. Fan favorites at the ISC16 student cluster competition, Thunderstruck consists of six undergraduates: Juan Francisco Martínez, Kevin Sala Penadés, Sandra Corella Pérez, Elisabet V. Breix, Yinghao Xu, and Josep Castro Salvadó. Filippo Mantovani and Daniel Ruiz acted as advisors. Not to be confused with the AC/DC song of the same name, Thunderstruck is the name of a student team that competed in the ISC16 high-performance computing Advisory Council (HPCAC) student cluster competition. Their second year in competition, this year the Mont-Blanc and Barcelona Supercomputing Center-sponsored team took home the ISC16 HPCAC ‘Fan Favorite’ award. The six-member Thunderstruck team from the Universitat Politècnica de Catalunya · Barcelona Tech (UPC) bested 12 other teams. To wow the fans, they built a 64-bit ARM cluster and ran a series of HPC benchmarks and applications. Congratulations to Thunderstruck and to all the student competitors. See you next year at ISC17! Spanning five days, ISC16 was held in Frankfurt, Germany. 400 different speakers presented to over 3,000 attendees from around the world. See the full list of HPCAC teams here. Join Science Node as we cheer on the student competitors at SC16 this November in Salt Lake City.